Hi, I am interested in your 1973 Chevrolet Monte Carlo (stock #4819-CHA) listed on Autotrader for $17,995. I'd like to get more information about this vehicle and confirm its availability. 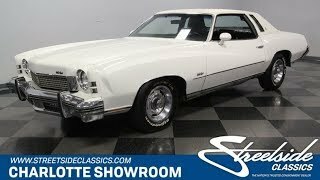 Low mileage, a fantastic profile, and highly original right down to the 8-track player this 1973 Chevrolet Monte Carlo is the classic that still knows how to make a personal luxury statement. The Monte Carlo was about rolling sophistication, and this one showcases it nicely. After all, it has a very regal presence with its correct white paint with white vinyl roof. But what really still catches your eye in modern times are the details. Up front, the large round headlights are nicely integrated into the pointed front end. The trunk has a crisp line that also creates a stylish overhang for the taillights. And nothing beats this coupes profile. The sweeping fender line that extends all the way into the doors is something theyd never dare try again today, and the rear fender has a sporty kick-up we love on muscle cars. Plus, theres all the right bright work, from the wraparound chrome bumpers to the Rally wheels. The black interior is the perfect contrast to the all white exterior. This car has averaged less than 1,700 miles annually, and the interior really tells you those miles have been easy ones. After all, theres not even a button missing from the two wide bench seats. Plus, the door panels, headliner, and dash all retain a nice dark appearance, too. All this black goes nicely with the factory burled walnut applique. In fact, this one is so correct that the factory AM/FM 8-track stereo is cranking out tunes. Plus, the factory air conditioning is still blowing cold, so you can happily share this time capsule with family and friends. The engine bay looks exceptionally authentic, and so youll love telling people this is the original 350 cubic-inch V8. Low mileage and a well-respected life mean this one fires up nicely. Plus, the four-barrel carburetor helps deliver the kind of torque you demand from a large classic American coupe. In fact, this one keeps its easy-cruising attitude with great driving features like power steering, front disc brakes, a three-speed automatic transmission, and sway bars front & rear. This is a well-preserved personal luxury classic that has all the right features you want. So at a price like this, its time to hurry to grab this deal. Call now!